Look no further for your perfect get away in St. Thomas. Our condo has stunning views of the ocean and surrounding islands. It's fully equipped w/ high end furnishings including all crate & barrel furniture throughout w/ gorgeous wood grains and high quality appeal. The kitchen is fully stocked w/ all the plates, cups, and other items you'll need to cook onsite. You have a 4 burner stove top and oven & microwave, premium 12 cup coffee maker, fridge and all the little things you'd expect in your kitchen. The bathroom features a designer tile surround, glass doors, floating vanity w/ designer sink and faucet and recessed LED accent lights. The sofa and chair are super comfy and your bed is super high quality. The patio overlooks the ocean and has one of the best views in the entire area. Enjoy your screened in patio which allows you to really "live" outdoors and is especially nice for that sunrise w/ coffee or a glass of wine after dinner. Condo is equipped w/ High Speed Internet, Cable TV, & a DVD player. Just take a short 5 minute walk down to the best snorkeling beach in St. Thomas....beautiful Sapphire Beach. Walk just paces down to an onsite restaurant/bar "Slice" which features excellent dining or poolside fare during the day. The town of Red Hook is less than 1 mile away where you can do shopping or enjoy a variety of restaurants and other entertainment for the evening. If this condo is booked look at our other listings(#907801, #1581513) which are also tastefully remodeled and have stellar reviews as well. My wife and I fell in love w/ St. Thomas after our Honeymoon nearly 20 years ago and wanted to have a place to come to relax and enjoy the gorgeous water and white sand beaches. We're excited to share our condo with you! Sapphire Hill Village is incredibly well maintained and the condo's have amazing views of the ocean as well as the surrounding islands. We have one of the best indoor/outdoor restaurants on the island, SLICE, and our condo has been featured on HGTV and is exquisitely appointed and very comfortable. The bathroom has had an extensive remodel done to it and features a floating vanity w/ designer sink, glass shower w/ tile and is very bright and beachy. Premium (Best your $$ can buy) New Split AC system with quiet operation and remote. Paddleboards, jet skis, kayaks, and other water toys can be rented right on the beach. We provide all your snorkeling gear! We've spared no expense in furnishing our condo with high end touches and appealing comforts. This condo was featured on HGTV's carribean life and is a little slice of Heaven! The condo was perfect for our short stay. It had everything a beach-goer would want: chairs, umbrella, coolers, snorkeling equipment, and even a blow-up boat (? I didn't pull it out to view.) The kitchen was tiny but very workable and provisioned with enough basics. The location was superb - on Sapphire Beach where the sand, water, and beach bar can't be beat and next to Red Hook for a bit more civilization if needed. The owner is very responsive. We are planning a fall stay. Thanks you! 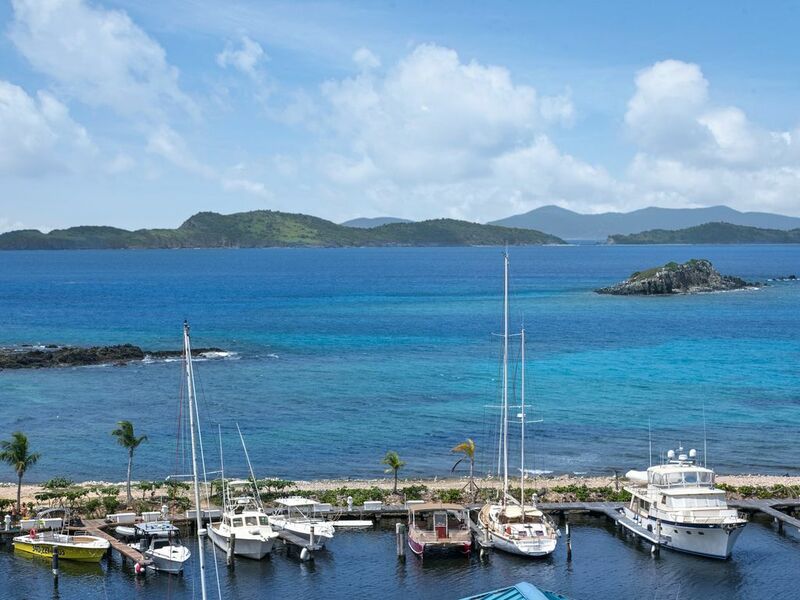 This is the perfect condo for a stay on St. Thomas. We love how close it is to Red Hook and the property and condo are immaculate. Woke up to an amazing views of St. John and lovely breezes everyday. The unit is decorated beautifully and has everything you need for your stay including beach chairs, beach bags, coolers and snorkel gear. No detail was overlooked! Sapphire Village has great amenities and a restaurant and bar on site that's open for lunch and dinner if you are looking to eat out. If you like to cook for yourself like we do the kitchen has all new pots and pans measuring cups cutting boards and food storage containers. There are even gas grills and charcoal grills on the property. The new beach bar at Sapphire Beach just down the hill has a "beach chic" atmosphere with live music great food and a new coffee shop with breakfast sandwiches and a yogurt bar. You can rent paddle boards and kayaks there too. Except for some sightseeing and a day trip to St. John we didn't leave the area much. It had everything we were looking for. The owners were great to work with and took extra care to make sure we had a great stay. We'll definitely be back!! We absolutely loved the condo!! It was very clean and had everything that we needed. The location to the beach and restaurants onsite was great. Beautiful view of the marina and very much enjoyed coffee on the balcony in the morning. The condo was as the pictures displayed. Couldn't have chose a more perfect condo for two!! Thanks so much for your great review 😁 We appreciate you guys trusting us with your vacation and hope you'll come back sometime. We stayed four nights and this studio condo was perfect for us. We spent lots of time on the patio & loved the beautiful view and warm tropical breezes. The pool & restaurant were great! We enjoyed walks along the beach & loved exploring the north side of the island by car. We had a couple of nice dinners in Red Hook which is only 1/2 mile way. Definitely best to have a car if you want to get around - difficult to walk very far with the narrow roads & no shoulder. We enjoyed the snorkel equipment, beach chairs and they thought of all of the essentials:) Great place!! Beautiful property. Very nice furnishings and the view is unbeatable. The hosts are extremely responsive, nice people. We loved the property and its location. Close to Sapphire (you can walk or drive down) and having a restaurant on site is a bonus. Laundry room on property (not in the studio- it's by the office) with the cost being $2.50 per load washer or dryer. One washer and one dryer were out of commission, so sometimes it can be difficult getting machines. Watch the cruise ship schedules when planning outings, even Sapphire gets overwhelmed if there's enough ships in port. The weather is perfect here. My only observations and keep in mind these are personal preferences and others might not care. The bed was not comfortable for either of us. Even with a foam topper, we felt it was too hard. The TV (Viya) is basic service only and pretty awful. Not much on, old, old reruns and the channel guide is rarely accurate. Very limited choices. Really nice bluetooth speaker in the room for streaming music, Internet (Viya) can be unpredictable, but that's not surprising for an island. There's some games and all sorts of beach stuff (chairs, noodles, snorkeling gear, etc.) Great bathroom and towels; the shower was a blessing. Often when we travel the showers in the bathrooms spit out a trickle. Not this one- NICE! The kitchen is tiny - hey it's a studio, you can only fit so much in it! but has everything you need with an apartment size fridge and stove; microwave, blender, etc. There's a balcony that overlooks the marina and ocean. Nice comfortable chairs to sit in and enjoy the amazing weather - There is a bug screen - we didn't like it, but then when we were there, there weren't any bugs. Other times of year may find the screen necessary. The owners are super accommodating, I would easily rent from them again. Any little hitch that came up was immediately addressed, we were super impressed! This was our second time staying at Sapphire Escape. I really don't think there is a better location on the East end. Condo was clean and welcoming, and the property was beautifully maintained. So glad to see the recovery from the two storms over the past year. Ryan was very quick to respond to any questions we had during our stay. Can't say enough good things about our stay. Already looking forward to our next visit.